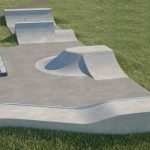 Wirksworth skatepark was designed and built by Freestyle in 2007 and can be found in a field on the outskirts of town. It is a bespoke wooden ramp park with both transition and street elements. Along one of the sides of the skatepark is a long quarter pipe hipped with a flat bank at one end. The other side has facing quarter pipes forming a mini ramp the back of which forms a spine and a jump box that opens up into the main body of the skatepark. 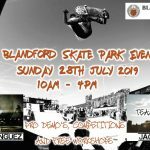 On the other side of the skatepark is a funbox with a jump box, hipped bank and hubbas and a ledge and in between the two is a manny pad. The end of the park is made up of another hipped bank with a block and rail at the top and on the other side is a hipped bank. 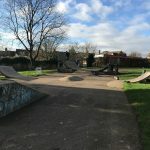 This is a nice local park and is unusual as it is one of the few wooden skateparks built by Freestyle. The surfaces aren’t as smooth as concrete but run true and the arrangement of the obstacles has been well thought out, appealing to skaters of all ability.It is a good place for those learning the basics and also more experienced skaters as well. Ambergate train station: As it is such a long distance from the station it would be recommended to get a bus or a taxi to get to Wirksworth skatepark.